Real talk for a second? When it comes to puberty, I kind of feel like Benjamin Button—at least where my skin is concerned. Hear me out. All through middle and high school (when my complexion should have been a tumultuous terror zone of oil and pimples), I had great skin. As in the type of skin that’s clear, cut from a cherub, verging on baby’s bum. While my friends relied on acne systems like Proactiv, I slid by with makeup-removing wipes and a sometimes routine of Cetaphil. My mom had always had perfect skin (if I didn’t love her so much, it would actually be quite maddening), and at the risk of sounding completely annoying, I just figured I was one of those people blessed with low-maintenance skin. Fast-forward to my freshman year of college—a solid six years post-puberty—and my skin was a train wreck. Riddled with whiteheads and pimples, I was dealing with what felt like an incessant cycle of aggravating breakouts. And I tried everything—from skincare to an OCD habit of only drinking purified water. Some things did help, and over the past six years, my skin has definitely taken a turn for the better. I adopted a more legitimate skincare routine and began investing in certain supplements and diet staples to help support a glowing complexion—totally buying into the theory that you are what you eat. My thinking: If I ingest all of the vitamins, minerals, and kale, shouldn’t my skin reflect accordingly? My head said yes, but my skin told another story. Despite taking skin supplements and eating salmon and plenty of leafy greens, I was still breaking out. 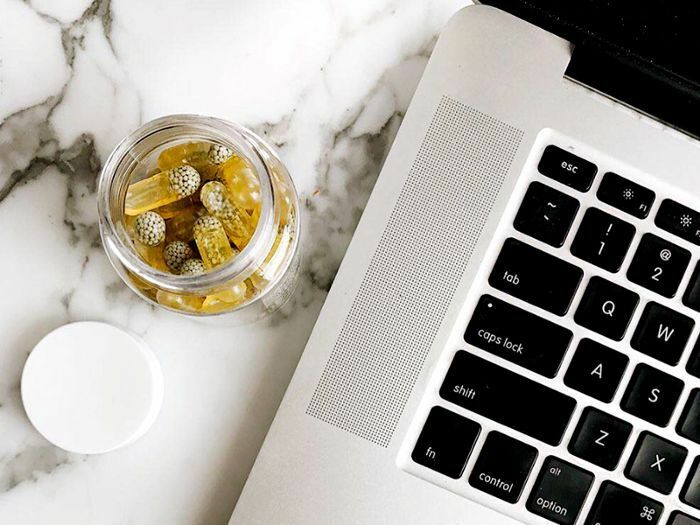 Then, during a whirlwind two-week period in which I landed my dream job and moved from San Francisco to Los Angeles, I stopped taking my vitamins cold turkey—pretty much what you’re so not supposed to do. Yet that’s when the unthinkable happened: My skin completely cleared up. You can imagine my shock. Wait, I thought to myself, weren’t these vitamins and supplements supposed to be helping my skin? After all, it’s not like I hadn’t done my research, and a few of the vitamins had even been recommended to me by a doctor who specialized in alternative medicine. To help make sense of the situation, I asked for some insight from dermatologist Elizabeth Tanzi, MD,founder and director of Capital Laser & Skin Care, and Thyroid Yoga founder Fern Olivia, a women’s thyroid and hormone health expert. Curious to see which vitamins may have been messing with my skin causing me to break out? Keep reading! What’s interesting is that initially, I began taking a fish oil supplement to help my skin. After all, science says it’s a good idea. However, both Tanzi and Olivia said that my fish oil supplement could be a sneaky culprit for worsening skin. According to Olivia, it all depends on the quality of the supplement, as fish oil is highly perishable. She explains, “The oil in the pill can expire and become rancid quite quickly. So the benefits of the omegas inside are nullified by the toxicity of rotten fish oil.” She also told me that when you’re selecting a fish oil supplement, you need to be vigilant about the sourcing since polluted waters can have a direct effect on the omegas in your go-to pill. Another possibility: B12. Though I wasn’t taking a skin supplement specific to B12, I was taking a multivitamin with a rather heavy-handed dose of it, which coincided with Tanzi’s opinion that my multivitamin probably wasn’t doing me any favors skin-wise. Oliva agreed, explaining that though B12 is essential to the body and deficiency can lead to some serious health problems, too much of the supplement can cause discord in the skin bacteria Propionibacterium acnes, which, in turn, can lead to acne. Again, Olivia warned about sourcing, explaining to me that cheaper versions of B12 can be sourced from cyanocobalamin, which can contain particles of cyanide. Uh, not good. I’m constantly on a quest to better my hair, skin, and nail health, so it’s unsurprising that biotin was steadfast in my rotation of supplements. Also known as B7 or vitamin H, biotin has a cult-like following where beauty is concerned and is touted to encourage accelerated hair and nail growth. However, according to Olivia, if biotin is taken too regularly (or in too high of dosage), it can do more harm than good—especially if you’re trying to keep your skin clear. Also interesting? Despite the vitamin’s grand reputation, Into the Gloss reported that there isn’t a whole lot of evidence to back up the supplement’s acclaimed health benefits to begin with. Since biotin is naturally produced in the body, it’s easy to overdose, which can lead to annoying breakouts. Since I stopped taking all of my vitamins at the same time, it’s impossible to know which were exacerbating my skin. Annoying. However, it’s been a month now, and my skin has been much happier than before—i.e., it’s less inflamed and bumpy—which, for now, is enough to keep me off the supplement train. However, if I ever decide to hop back on, you can bet I’ll make sure to keep both my biotin and B7 levels in check and pay close attention to where my fish oil is coming from. Ed. note: Be sure to speak with your personal physician when considering significant changes to your diet. Have your supplements ever made you break out? We’d love to hear your experience below in the comments. Next up, these are the vitamins that will boost your metabolism.